January 2008 - Archaeologists from the Hebrew University of Jerusalem have discovered an ancient synagogue among the ruins of a large Jewish village from the Roman-Byzantine era at the foot of the Mt Nitai cliffs overlooking the Sea of Galilee. Excavations in the Khirbet Wadi Hamam were led by Dr Uzi Leibner who explained that the synagogue is a good example of the eastern Roman architectural tradition; a unique feature is the design of its mosaic floor. The first season of excavations revealed the northern part of the synagogue constructed of basalt and chalk from an earlier structure on the site with two rows of benches along the walls. The report explains that there is a significant disagreement between archaeologists as to when the ancient Galilean synagogues were built. The generally accepted view is that they date from the later Roman period (second to fourth centuries C.E.) a time of Jewish cultural and political flowering. Recently, some researchers have suggested that they mainly date from the Byzantine period (fifth and sixth centuries C.E.) when Christianity rose to power and Jews may have suffered persecution. 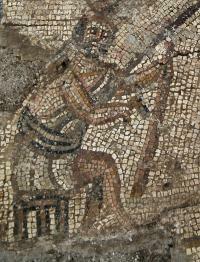 Excavators found a unique mosaic decoration in the eastern aisle of the synagogue made of tiny stones (4mm) in a variety of colors. The scene depicts woodworkers holding various tools of their trade near a monumental structure which they are apparently constructing. The report explains that Biblical scenes are commonly found in synagogue art and this may represent the building of the Temple, Noah's ark, or the tower of Babel. The mosaic floor has been removed and is in the process of restoration. "There are those who tend to believe that the rural Jewish villagers of that era lived in impoverished houses or in huts and that the magnificent synagogues existed in contrast to the homes that surrounded them. While it is true that the synagogues were built of a quality that exceeded the other structures of the village, the superior quality private dwellings here testify to the impressive economic level of the residents."